Having discovered the author Tracy Rees when I read The Hourglass (loved it! ), I seem to be working my way backwards through her releases! At the end of last year I read Florence Grace (loved that too!) 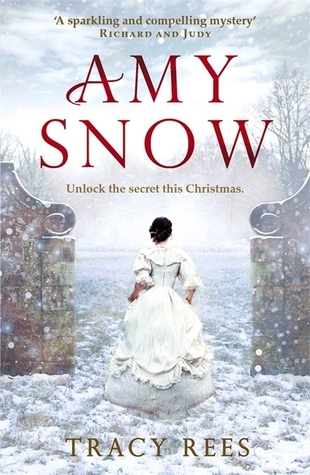 so when I managed to get my mitts on Amy Snow I knew I was in for a treat! Another engaging, emotional story from this author who is fast becoming one of my favourites with her quality of writing and storylines! The story of Amy and her quest to find her place in the world was a fascinating one. From the moment she was born and found in the snow by Aurelia, she never really fitted in with others, but Aurelia was always there for her and vice versa. After the sad passing of Aurelia, it was obvious her family weren't going to endure her being around, and I loved how Aurelia had set up a 'treasure hunt' so to speak, to share her story and legacy after she was gone, and to pass on to Amy all that she knew and all that she had kept hidden from Amy despite their strong bond. There was plenty of mystery and intrigue throughout, which mixed well with Amy and her experiences of travelling around the country on her own as a woman, and finding people who knew Aurelia and didn't judge Amy because of her past and accepted her for who she was. Despite it being a big 'chunkster' of a book, the story flew by and I suffered from the 'ooh just one more chapter' disease that strikes when a story has me under its' spell! Eagerly awaiting the next release from Tracy Rees now, which is due to be out later this year!! !